I don't even know who I am anymore. My entire world has been turned upside down and inside out in a matter of 3 weeks and there is absolutely nothing I can do about it. I have never been so scared or helplessly lost. I am in constant pain and it is getting worse with each day that passes. It's a lot worse than we originally thought and I am terrified the numbness isn't going away. And now it's spreading to my left side and I feel it spreading upwards and I know it is only a matter of time. I am hopeful the steroids will work, because if they don't, I have no other options. And the thought of this is unbearable. There is no "plan B", there is no miracle drug, there is no magic pill. I want so desperately to curl up into a ball in my bed and stay here for the rest of eternity, yet I fight this urge every morning. I trudge on and force myself to move, to get going and to get on with life. Part of this is sheer stubborness, and I refuse to succomb. The other part is because my life isn't just about me anymore. I have a daughter who is my world and it kills me that I am not supposed to lift her up anymore. She wants me to hold her and I can't and it is just not fair. And I have no idea how to explain to her what is going on with my body. She is 4, and she is the reason i refuse to give up. She is the only thing I have ever done with my life that has made sense. She is growing up so fast. I have a fiance who has stood by my side, the silent and rock steady person who's shoulder is soggy with my tears. I know this is killing him. I have watched his heart break and know it is my fault. Yet he remains steady and unfaultering, an emotional robot at times. I don't know what he's thinking and it drives me insane. I don't know how he is dealing with this, and becuase of that I don't really want to tell him how bad it is getting. I don't think he could handle it and I question if he is really staying. We are looking at marriage and the finacial benifit that would come with it and I feel guilty that he is put in this position. I don't know what i have to offer him, I don't know what's going to happen 6 months from now. I don't know how my body is going to hold up, and I feel guilty for wanting to marry him. Does he really know what he is getting into? And the very thought of living without him tears me up inside. I don't question his love for me I never have, but I don't know what I have to offer him. I keep trying to wake up form this nightmare and each morning I awaken so stiff that I can barely move and I feel like reality has come back to slap me in the face once more. I am angry that I have no answers. I am angry that I can't beat this, and I am angry that I have no one to blame for this. It's not like I slept with someone and caught this, it's not all genetic, it's nothing that I could have done in my life to prevent this disease from taking over my body and I am angry that I cannot blame anyone for it. And if it isn't bad enough that my body is failing me and refuses to cooperate I can't seem to find a common ground with my emotions and it's like the roller coaster from hell that just never ends and I don't know how to deal with this on my own. I know that I have to be strong and I know that I have to fight this, but I don't know how. I am entrusting my life to a doctor I have met all of 3 times and I have no choice. I have been poked and prodded, X-rayed, scanned, and now I get to go have a spinal tap. Nothing like the thought of a needle being guided past your spine and into your spinal cord to make you want to keep on going. I am just so lost. 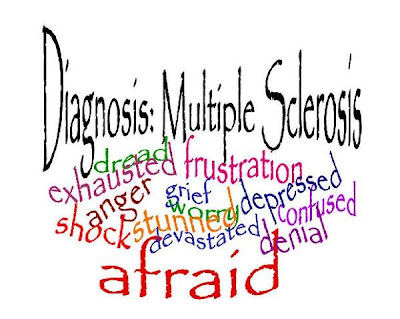 If you have ever wondered what it is like to be diagnosed with this disease this picture says it all. 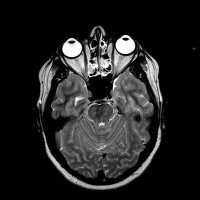 This has got to be my favorite MRI pic!